Myrna Fruitt was born and raised in Boston and spent her life living and painting in that city's suburbs. Myrna began her career as a school teacher but art always called out to her. She started painting in the 1970's and studied with noted artists Lois Tarlow, Rubin Gold, Marjorie Gold, Joyce Shoupe, and Renee Rubin. 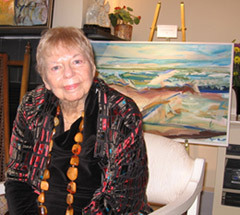 For more than 40 years, she brought her vibrant spirit to her paintings, watercolors, and woodcuts. She died in August 2014 but her legacy lives on in the hundreds of canvases that grace the walls of art lovers in private homes and public buildings throughout New England. I consider myself an intuitive painter and approach my canvas with no preconceived idea of what the painting will ultimately become. Some of my paintings have brush strokes that create an angular distortion of the subject. I relate intimately to improvisational jazz, which influences the coming together of emotional color and rhythms in my work. I am sensitive to nature and draw upon my impressions of a particular time and place. These influences, along with my memory and experiences, combine in a spiritual blending that is translated onto my canvas. reproduced or used for any purpose without the expressed written consent of the artist.